The newest event at Easy Street’s Heart of Texas Recumbent Rally is the Texas Trike Shootout. I expect this event to be exclusive to the 2019 rally. Back in the 1990’s when ESR got started, the #1 recumbent news source was Recumbent Cyclist News, and editor Bob Bryant did reviews of any ‘bent he could get his hands on. When Bryant managed to get two closely-competing bike or trike designs in his stable at once, he’d do a dual, comparative review called a “shootout.” I’m borrowing that term here. 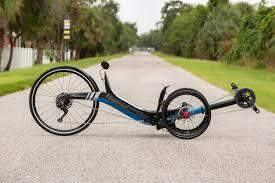 Earlier in 2018, Bacchetta Bikes made a splash at Recumbent Cycle Con by introducing the Bacchetta CT2.0 carbon racing trike. The CT 2.0 took an existing European design and enhanced it with innovations used by Bacchetta, known mainly for making fast recumbent two-wheelers. Prior to this, there were only two “fast trikes” that one could buy “off the rack,” so to speak: The Catrike 700 and the ICE VTX. I will not knock the 700’s speed, but it keeps a lot of sport-touring ideas, like the mesh seat and rear disk drag brake, and a plethora of standard accessories for comfort. It was not a full-blown “win at any price” trike like the VTX, with its carbon shell seat, titanium axles, and meticulously analyzed and hydroformed frame geometry. The VTX is the one to beat. Can the CT 2.0 do it? Well, let’s find out! At the 2019 rally, Bacchetta and ICE pit crews will be attending with their trikes. Here is how it will work. A select group of rally attendees, probably 10-15 people, will each race both models. (See below for how we’ll decide who races.) These races will be competitive with both trikes on the course at one time. We’ll lay out an out-and-back course, making a steady climb to a turn-around, so climbing speed is a factor. The trikes will circle a pole before returning, so turning radius and turning stability is a factor. Then the trikes descend to the finish, so top speed is a factor. We will measure all the individual times for each trike. We will also count total wins. The trike with the lowest overall time across all riders wins. The trike with the most individual victories wins. Most likely these measurements point to the same winner, but I’d be curious to see why if they don’t. We will see how an individual’s times compare on each trike, and the companies can look into why different people’s times vary. We intend for a variety of people to race, not just the biggest, fastest people. Sure, someone signed up for the Warriors’ ride will ride faster than someone signed up for the Scenic ride, but we’d like men, women, short, tall, big, small, old, young… a wide variety of people to race these. All this is to help both companies make a better racing trike. And we’re doing it to have fun! The course will be laid out to give a competitive spectacle but also to be safe. We don’t want anyone dying for the cause, here. We’ll aim to give lots of people a crack at this, but we will limit the number of racers just because we figure people will only want to watch two trikes race each other for so long. We will do some time trials on Friday to determine who will race, along with our own selection criteria. So, let us know id you want to do it (email works, use culture@wemakecyclingeasy.com), get there on the early side, and make sure you are on the list when you arrive. Whether you race or not, you’ll be able to ride both trikes. Experts will be on hand to help you get off that low seat! We’ve got all weekend and lots of opportunities to ride. If you want to race then contact trikemike@wemakecyclingeasy.com and let me know, but it isn’t essential that you do. Please get to the rally as soon as you can so we can put you in the time trials. Just because you aren’t the fastest rider doesn’t mean you shouldn’t race. Leggy Lance bike racer types are welcome, but so is fat old granny. We want a diverse range of riders, and since each rider’s times count toward both trikes, we’ll still be doing a balanced assessment of the trikes even if Lance vs. granny isn’t a balanced race. That’s it. Since I don’t foresee a product release like this every year, expect this laid-back showdown only at the 2019 HOT Rally in Keller. Both are excellent trikes, but it would be an even better comparison if you included the Catrike 700 and the Greenspeed Aero. And Santa,before he returns to the North Pole. Let’s not forget the Windcheetah, the Innesenti, and that carbon thing that Performer makes. I’m sure there are more fast trikes if you beat the bushes enough. But to avoid standing in the parking lot all day we’re keeping it to two, and these are the significant ones. The Catrike 700 is an excellent trike, and an excellent value compared to a $6000 VTX or $6500 CT 2.0, and from work I did support a Race Across the West rider it is the choice for ultra-marathon trike racing. We’ll be using a couple of 700’s for our time trials on Friday. But for short, intense races the VTX has been the one to beat. Since Santa should be in his slow season come March hopefully he’ll come back to the HOT, like he did in 2017. He’s pushing the weight limit on these trikes, but usually packs more magic fairy dust than most attendees.